We love setting the stage for imaginative play and fun! 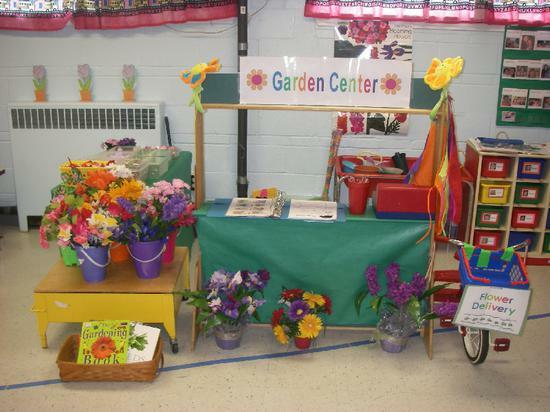 A flower shop would fit seamlessly into your spring/summer lesson plans and, after stumbling upon this amazing garden center featured at SparkleBox, knew we had to pass this particular pretend play center along. Isn't it fabulous?! With glorious bunches of colorful flowers that can be collected, wrapped, and 'sold', we LOVE the order forms and flower identification book, the tricycle for 'making deliveries', and all the other little details! Under the guise of play, students are sure to strengthen all sorts of skills - social skills, small motor function, and writing among them! If you need some inspiration to help you get started, we highly recommend checking out this amazing flower shop!